Chartreux cat breed information. The Chartreux cat is a robust breed with French origins and a very long history. The Chartreux is an ancient breed with a long history, but is still relatively unheard of in the UK. However, due to the breed’s calm, affectionate, and inquisitive nature, it shouldn’t be long before these cats find themselves in more family homes across Britain. The breed club was only formed last year by lifelong dog lover, Goran Nilsson, who took a chance on the Chartreux and fell in love with the breed’s charming and inquisitive personality. “After my elderly Labrador was put to sleep in 2013, I decided I wanted another pet: a smaller, cuddly one who I didn’t have to take for walks!” jokes Goran, from Ashford, Kent. He continues: “Of course, I didn’t know if the Chartreux they were breeding was the French ‘dog-cat’, but I took a chance and reserved a male kitten, Jay. “My wife and I fell in love with him and the breed, and I think that the Chartreux ticks all the right boxes. They are very affectionate, although they’re not lap cats, as they’re not constantly trying to crawl on you. They’re just a real delight to have around and I can’t fault their personalities. Goran also explains that the Chartreux is very intelligent and Jay has learned the commands ‘no’, ‘stay’, and ‘sit’, will play hide-and-seek, and recognises sentences such as ‘Do you want to go out in the garden?’. “I applied to have the breed recognised by the GCCF in May 2015 and it gained status five months later,” explains Goran, who, with a couple who also owned a Chartreux, co-founded the Chartreux Cat Club UK in October 2016. It is now a provisional member of the GCCF. “As we had the first registered male in the UK, I thought that it would be nice to also have the first registered female and the first registered kittens,” says Goran. He continues: “I recently took Jay and a female to the National Pet Show, and they proved to be really popular with visitors — many were attracted to their soft coats and beautiful eyes. The Chartreux is sometimes confused with the British Shorthair, due to its semi-cobby body and full cheeks, but these cats definitely have an identity of their own. The males have well-developed jowls and are generally larger than the females, who tend to be smaller but still well-muscled. They have large, beautiful eyes which vary from yellow to copper in colour. Their coats are only ever blue, but the colour can range from pale to deep shades. It has often been said that the breed looks like it’s smiling, due to its full whisker pads and firm chin, which allows the cats to have sweet expressions. Although the origins of the breed are unclear, it’s believed that its ancestors originated in the mountainous regions of Turkey and Iran. They were brought to France by returning crusaders in the 13th century and the country adopted the breed. It is possible that these cats were named after the luxurious Spanish wool, ‘la pile des Chartreux’, because of the woolly nature of their coats. Natural colonies were known to exist in Paris and in isolated regions of France until the early 20th century. However, after the First World War, French breeders became interested in preserving the cats, as no major breeding colonies of pure Chartreux existed. One colony was found living on an island off the coast of Brittany by Christine and Suzanne Léger, who began monitoring the cats and eventually began selective breeding. The modern Chartreux descends from these cats. These cats are generally low maintenance and healthy, and there are no genetic problems associated with the breed. Responsible breeders will be conscious about the possible risks of inbreeding, and take extreme care in choosing which cats to mate. The Chartreux has a dense, slightly woolly coat, which requires gentle combing (not brushing) regularly; these cats tend to shed throughout the year because they are generally kept as indoor cats. 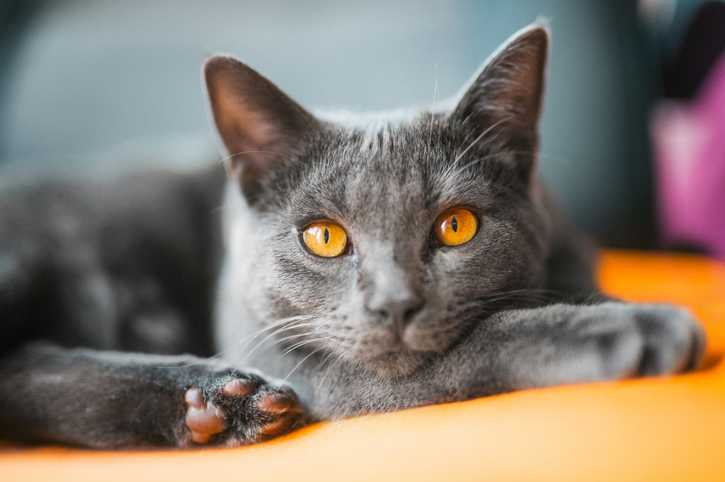 Is the Chartreux cat the breed for you? These cats are a real delight to own and adapt well to most lifestyles. Goran advises that they are kept as indoor cats, however they do like the chance to be outdoors on sunny days. He has secure cat-fencing in his garden so his four cats are able to stretch their legs — and they even enjoy going for walks on a lead.